The Qazvin Province is one of the 31 provinces of Iran . It is in the north-west of the country , and its center is the city of Qazvin . The province was created in 1993 out of part of Tehran Province and includes 20 cities : Qazvin , Takestan , Abyek , Buin-Zahra , Eqhbalieh , Mohammadieh , Alvand , Esfarvarin , Mahmood Abad Nemooneh , Khoram Dasht , Ziä Abad , Avaj , Shäl , Danesfahan , Abgarm , Ardägh , Moallem Keläyeh , Razmian Kouhin and Bidestan in the form of four townships (chief cities) contains 18 sections , 44 rural districts , and 1543 villages . The province was put as part of Region 1 upon the division of the provinces into 5 regions solely for coordination and development purposes on June 22nd , 2014 . The province had a population of 1.2 million people by the 2011 census , of which 68.05% lived in cities and 31.95% in villages . The ratio of men to women is 50.7 to 49.3% . 99.61% of the province population were Muslims and 0.39% of the rest came from other religions . The literacy rate is over 82% , ranking 7th in Iran . The province covers 15821 km² between 48-45 to 50-50 east of Greenwich Meridian of longitude and 35-37 to 36-45 north latitude of the equator . The province is bounded on the north by Mazandaran and Gilan , on the west by Hamedan and Zanjan , on the south by Markazi and on the east by Tehran Provinces . The famous mountains of the province are those of Siälän , Shäh Alborz , Khashchäl , Sephidkouh , Shojä e din , Alehtareh , Rämand , Ägh dägh , Kharaghän , Saridagh , Soltan pïr , and Siähkouh , in which Siälän with a height of 4175m and Shäh Alborz which is 4056m are the highest . All are part of the central chain of Alborz . The lowest point of the province is in Tärom e Soflä . The climate of the province in the northern parts is cold and snowy in winters and temperate in summers . In the southern parts the climate is mild with comparatively cold winters and warm summers . The majority of the people of the province as well as the city of Qazvin are Persian people and the main language of the people of Qazvin is Persian language with the Qazvini accent . Other languages include Azeri , Tati , Kurdish , Luri and Romani . Qazvin was the location of a former capital of the Persian Empire and contains over 2000 architectural and archeological sites . It is a provincial capital today that has been a cultural center of mass throughout history . Archeological findings in the Qazvin plain reveal the existence of urban agricultural settlements as far back as 7000 BC . The name “Qazvin” or “Kasbin” is derived from Cas , an ancient tribe that lived south of the Caspian Sea millennia ago . The Caspian Sea itself in fact derives its name from the same origin . Qazvin geographically connects Tehran , Isfahan , and the Persian Gulf to the Caspian seacoast and Asia Minor , hence its strategic location throughout the ages . Qazvin has been a hotbed of historical developments in Iranian history . In the early years of the Islamic era Qazvin served as a base for the Arab forces . Destroyed by Genghis Khan (13th century) , the Safavid monarchs made Qazvin the capital of the Safavid empire in 1548 only to have it moved to Isfahan in 1598 . During the Qajar Dynasty and contemporary period , Qazvin has always been one of the most important governmental centers due to its proximity to Tehran . Abbas Mirza , a Crown Prince and Minister of Commerce , was also the governor of Qazvin . Qazvin is situated close to Alamut , where the famous Hasan-i Sabbah , founder of the secret Ismaili order of the Assassins , operated from . Qazvin is where the coup d’etat of General Reza Khan , with his Russian-trained Cossack brigade , was launched from - which led to the founding of the Pahlavi dynasty in 1921 . Qazvin contains several archeological excavations dating back 9000 years ago . There are also 23 castles from the Ismaili Assassins nearby as well . And in the middle of the city , there lies the ruins of Meimoon Ghal'eh , one of several Sassanid edifices in the area . Qazvin contains few buildings from the Safavi era when it was capital of Persia . Perhaps the most famous of the surviving edifices is the Ali Qapu mansion , today a museum in central Qazvin . · Jame e Atigh Mosque : One of the oldest mosques in Iran constructed by the orders of Harun al-Rashid in 807AD . In spite of the devastating Mongol invasion , this mosque still stands today in its full glory . · Heidarieh Mosque : Renovated by Amir Khomär-täsh after the earthquake of 1119 AD , the history of construction of this mosque goes back to pre-Islam , where it was a fire temple . · Masjed Al-nabi (Soltani Mosque) : With an area of 14000 m2 , this mosque is one of the most glorious mosques of antiquity , built in the Safavid period . · Sanjideh Mosque : Another mosque of Qazvin dating back to pre-Islamic Iran ; a former fire temple . Its present day form is attributed to the Seljukian era . · Panjeh Ali Mosque : A former place of worship for royal harem members in the Safavid period . · Peighambarieh School-Mosque : Founded 1644 according to inscription . 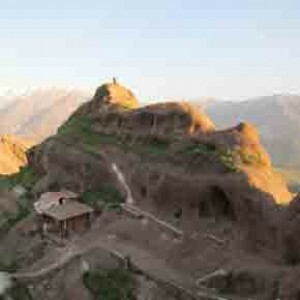 · Peighambarieh Shrine : Where four Jewish saints who foretold the coming of Christ , are buried . · Molla Verdikhani School-Mosque : founded in 1648 . · Salehieh School-Mosque : founded in 1845 . · Sheikhol Islam School-Mosque : renovated in 1903 . · Eltefatieh School : Dating back to the Il-Khanid period . · Sardar School- Mosque : Made by two brothers Hossein Khan and Hassan Khan Sardar in 1815 , as a fulfillment of their promise if they came back victorious from a battle against the Russians . Qazvin actually contains three buildings built by the Russians in the late 19th/early 20th century . Among these is the current Mayor's office (former Ballet Hall) , a water reservoir , and the Cantor church where a Russian pilot is buried . According to explorers Pietro Della Valle , Jean Baptist Tavenier , Johannes Chardin , and others , there have been many Christians of various sects living in Qazvin for centuries . Qazvin is the location of the Saint Hripsime church , and it is also where four Jewish prophets gave tidings of the arrival of Jesus Christ . Their tomb is now a popular shrine called Peighambariyeh . Another grand attraction in Qazvin Province , is the tombs of two Saljuki era princes , Aboo Saeed Bijar son of Sad and Aboo Mansoor Iltai son of Takin , that are located in two separate towers known as the Kharaghan twin towers . Constructed in 1067 , these are the first monuments in Islamic Architecture which include a non-conic two-layered dome . Both towers were severely damaged by a devastating earthquake on March 2003 . In the old days , Qazvin was nicknamed the 'city of water reservoirs' . Of the 100 or so water reservoirs of Qazvin , only 10 remain today , all protected by the Provincial Cultural Heritage Organization . See : List of famous ab anbars of Qazvin . Residential towers like Ponak (536 units) , Sky (Aseman , 300 units) 17 levels , Elahieh and Bademestan (440 units) with 17 levels . · Ali Akbar Dehkhoda : Prominent linguist and author of Iran's first modern Persian dictionary , was originally from Qazvin . · Oveis Qarani : A celebrity of early Islam , thought to have been killed here while fighting against an army of Deilamian origin . His tomb is known as Sultan Veis . · Hamdollah Mostowfi : The great Il-Khanid historian and writer (1281–1349) and author of The Selected History (Tarikh Gozideh) , Nezhatol Qoloub and Zafar Nameh . The turquoise conic dome and its inscription in Sols calligraphy in which Mostowfi’s family tree and his works are introduced are the features that distinguish the tomb from other historical monuments of Qazvin . · Imam Ahmad Ghazali : Famous Iranian Gnostic who died in 1126 CE and was buried beside Shahzadeh Hossein . His tomb up to the end of the 16th century A.D . became the pilgrimage place for mystical sects . Following Shah Tahmasb’ s stubborn policies against philosophers and mystics and destroying Ghazali’s tomb , a group of his disciples took the remains of his body to the present place in Imamzadeh Ismail alley and constructed a new mausoleum for him . The monument was destroyed again in Mohammad Shah Qajar’s period only to be re-constructed by Majdol Islam Qazvini in 1910 . Beside Ghazali’s tomb there is another tomb belonging to Soltan Seyed Mohammad Vali which dates back to 1625 CE . · Molla Khalil Ibn Ghazi Qazvini : Famous faghih (religious jurist) and famous commentator of the Qur'an in Safavid period (d 1678) . · Shahidsaless : Killed in 1846 . The third religious leader to be killed during prayer (first one being Imam Ali) . · Ra'ees ol-Mojahedin : The late Mirza Hassan Sheikhol Islam son of Mirza Masood Sheikhol Islam , leader of the liberals and constitutionalists of Qazvin whose endeavors and devotion to abolish the Qajar dynasty and conquer Tehran brought the title of Raeesol Mojahedin (chief of fighters) for him . 13,000 km² are under cultivation in the province , covering 12% of the cultivable lands of the country . These are fed by numerous subterranean canals , deep and semi-deep wells , and a large irrigating canal which originates from The Sangbän dam in Taleghän and Ziärän . The agricultural produce of the land is grape , hazelnut , pistachio , almond , walnut , olive , apple , wheat , barley , sugar beet , pomegranate , fig , and cereals . Animal husbandry , and aquatic and poultry breeding are developed throughout the province . In recent decades , Qazvin has become a developing pole of the country , primarily due to its preferable location . Qazvin today is a center of textile trade , including cotton , silk and velvet , in addition to leather . It is on the railroad line and the highway between Tehran and Tabriz . Qazvin has one of the largest power plants feeding electricity into Iran's national power grid , the Shahid Raja'i facility , which provides 7% of the country's electricity .